CasinoHeroes - Be the Hero you always wanted to Be & Win! CasinoHeroes is a company that saw the day in 2014. In 2015 the company changed its name and the brand that we know today was born. Even though the company re-branded itself in its early days, the owners’ vision was always clear! In fact, the teams’ goal was always to create a casino with a difference and to re-define the player’s experience. And looking at the site today, there’s no doubt that they’ve accomplished their goal. Indeed, CasinoHeroes is a beautiful website with 3D characters that will take you on an adventure through islands. What’s more is that as you progress, you’ll defeat bosses and earn extra rewards too! General Concept: Gamified casino themed around a world where players beat bosses to earn extra rewards. Game providers: Yggdrasil Gaming, Push Gaming, QuickSpin, Microgaming, Play’n Go, NetEnt, PlaySon, Evolution Gaming, SG Digital, NYX Gaming, Thunderkick, NextGen and many more. Special features: Islands to discover and treasures to unlock. Customer care availability: Open Daily between 8:00 until 23:00 (GMT) via Chat and emails. Payment methods accepted: Neteller, Trustly, MasterCard, Visa, Zimpler, Skrill, and ecoPayz. There’s nothing like exploring a new casino with generous bonuses! So let’s recap what CasinoHeroes gives to new players. So, they’re two different welcome bonuses you can claim. The first one is 100% up to £100 + 200 Free Spins. So, those who’ll maximise this offer will play with £200, plus the money won from their Starburst Free Spins! The 200 Free Spins are given over ten days, so you get 20 a day. Alternatively, if you love Free Spins, perhaps you’ll be more interested in claiming the 300 Free Spins offer (but no matchup bonus) when depositing £100 or more. 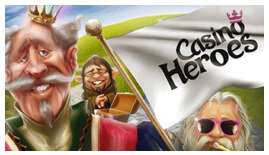 CasinoHeroes also offers deposit bonuses on the second, third, and fourth deposits. The percentage you’ll get varies from 25% to 50%. Alternatively, you’ll have the option to get 100 Free Spin per deposit, depending on the offer you choose. The Free Spins and bonuses are subject to 40x wagering requirements. Very much like many gamified casinos, the loyalty program is integrated to the website. So, you’ll earn rewards as you progress through the islands. What’s more is that CasinoHeroes also has a loyalty shop, where you’ll have the chance to buy Free Spins, Super Spins and cash bonus using Rubies. The Rubies are the currency on this site. And know that as you play, you’ll earn rubies for completing different missions and task. Additionally, know that even if they don’t advertise a VIP program as such, our sources confirmed that they have a VIP team. What’s more is that the VIP team members are always on the lookout for players to give extra rewards too. And once you’ve met specific criteria, they’ll get in touch with you via email to welcome you to the exclusive club, and they’ll tell you more about the unique benefits of becoming an elite member! This is a fantastic casino to sign up to if you’re looking for more than just playing slots and table games! What’s more is that the operator pride itself in offering an excellent game selection to players. And believe it or not, they frequently ink deals with new game providers. So, there’s always something new to try when you sign up there. Also, we have to admit that we especially liked the versatility of their welcome offers. Indeed, it’s not every day that you’ll have the chance to choose between getting a matchup bonus and 200 Free Spin or 300 Free Spins! Start your adventure now and have fun!